So you've been using create-react-app a.k.a CRA for a while now. It's great and you can get straight to coding. 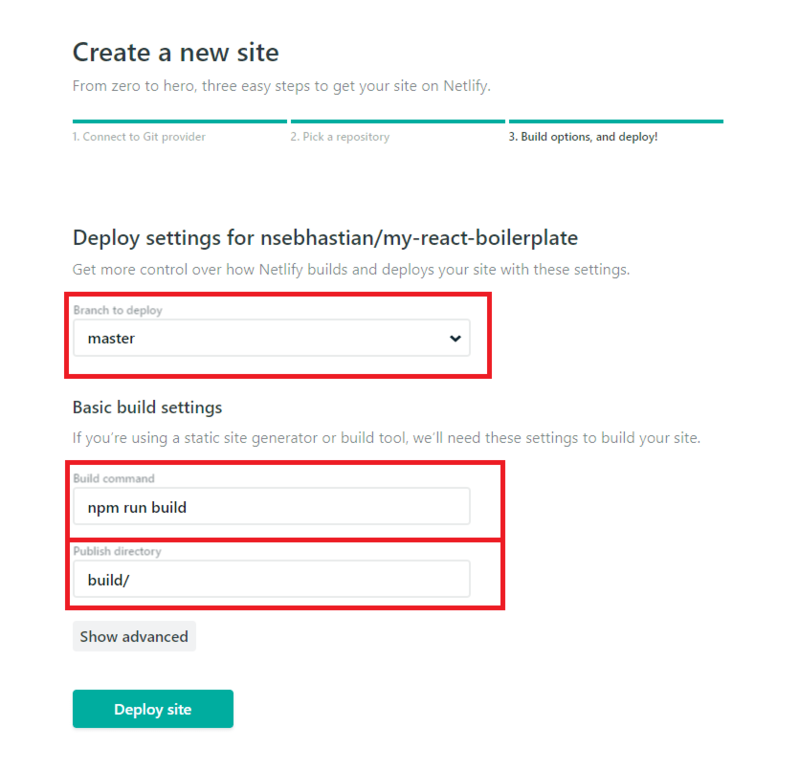 But when do you need to eject from create-react-app and start configuring your own React application? There will be a time when we have to let go of the safety check and start venturing out on our own. This guide will cover the most simple React configuration that I personally used for almost all of my React projects. By the end of this tutorial we will have our own personal boilerplate and learn some configurations from it. Why create your own configuration? I found errors! What do I do? There are certain reasons that make creating your own React configuration make sense. Obviously, you are good with React and you want to learn how to use tools like webpack and Babel on your own. These build tools are powerful, and if you have some extra time, it's always good to learn about them. Developers are naturally curious people, so if you feel you'd like to know how things work and which part does what, then let me help you with it. If you look around the Internet, there are some hacks to get around CRA limitations like create-react-app rewired. But really, why not just learn React configuration on your own? I will help you get there. Step by step. Now that you're convinced to learn some configuration, let's start by initializing a React project from scratch. Also, you can view the source code on GitHub while reading this tutorial for explanations about the setting. Run the webpack by using npm run start ... And an error will be triggered. The React component we wrote above used the class syntax, which is a feature of ES6. Webpack needs Babel to process ES6 into ES5 syntaxes in order for this class to work. Why we need these packages? This webpack config is basically saying that the entry point of our application is from index.js, so pull everything that's needed by that file, then put the output of the bundling process into the dist directory, named bundle.js. Oh, if we're running on webpack-dev-server, then Tell the server to serve content from contentBase config, which is the same directory this config is in. Also place the bundle.js in the dist/ directory, please. For all .js or .jsx files, use babel-loader to transpile all of them. Now run npm run start again. This time it will work. To further speed up development, let's make our code formatter using Prettier. Install the dependency locally and use the --save-exact argument since Prettier introduce stylistic changes in patch releases. The rules means that we want to add semicolon for the end of every statement, use a single quote whenever appropriate and put trailing commas for multi-line ES5 code like object or array. Since webpack bundles the code, source maps are mandatory to get a reference to the original file that raised an error. For example, if you bundle three source files (a.js, b.js, and c.js) into one bundle (bundle.js) and one of the source files contains an error, the stack trace will simply point to bundle.js. This is problematic as you probably want to know exactly if it's a, b, or c file that is causing an error. Although it will cause slower build, it has no effect on production. Sourcemaps are only downloaded if you open the browser DevTools. eslint is the core dependency for all functionalities, while eslint-loader enables us to hook eslint into webpack. Now since React used ES6+ syntax, we will add babel-eslint — a parser that enables eslint to lint all valid ES6+ codes. 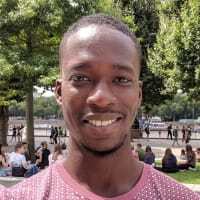 eslint-config-react and eslint-plugin-react are both used to enable ESLint to use pre-made rules. The config is basically saying, "Hey ESLint, please parse the code using babel-eslint before you check it, and when you're checking it, please check if all the rules from our React rules config is passed. take global variables from the environment of browser and node. Oh, and if it's React code, take the version from the module itself. That way the user won't have to specify version manually." Then run it with npm run eslint-fix. 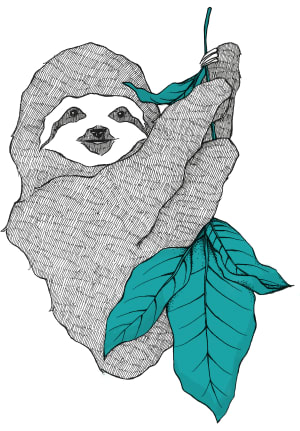 Don't worry if you're still fuzzy about ESLint for now. You will learn more about ESLint as you use it. less-loader will compile our less file into css, whil css-loader will resolve css syntax like import or url(). The style-loader will get our compiled css and load it up into <style> tag in our bundle. This is great for development because it lets us to update our style on the fly, without needing to refresh browser. Run the start script and we're good to go! All applications need to be deployed for its last step, and for React application, deployment is very easy. First, let's change the build output and development contentBase from dist to build in our Webpack config. This plugin will generate index.html file in the same directory where our bundle.js is created by Webpack. In this case, the build directory. Now you can test the config with npm run build command. Once it's done, push your boilerplate into a GitHub repo. It's time to deploy our application! Let's register a Netlify account. You need to grant permissions for Netlify, and then select your React boilerplate repo. Now you need to enter the build command and publishing directory. As you can see, this is why we need HtmlWebpackPlugin, because we need to server everything from one directory only. Rather than manually updating our root index.html file for changes, we just generate it using the plugin. Make sure you have the same command as the screenshot above, or your app might not run. 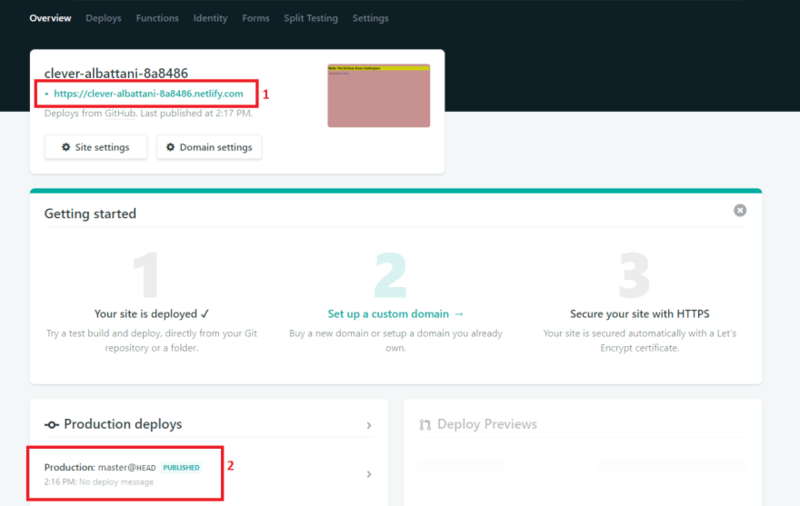 Once the deploys status turns to published (number 2 above), you can go to the random site name Netlify has assigned for your application (number 1). Your React application is deployed. Awesome! 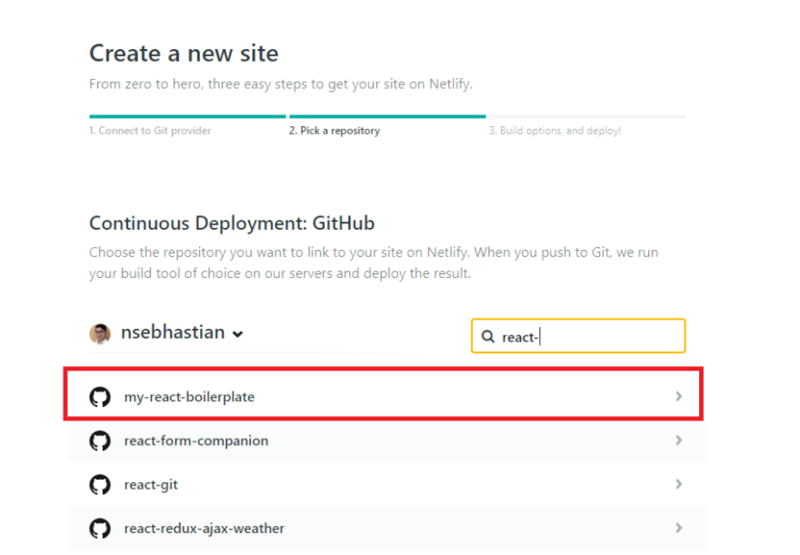 You've just created your very own React project boilerplate and deploy it live to Netlify. Congratulations! Granted, I didn't go very deep on webpack configurations, because this boilerplate is meant to be a generic starter. In some cases where we need advanced features like server side rendering, we need to tweak the configuration again. But don't worry! You've come this far, which means you already understand what webpack, Babel, Prettier and ESLint do. Webpack has many powerful loaders that can help you with many cases you'll frequently counter when building a web application. Don't worry if you're still uncomfortable with configurations. You'll get used to it as you practice more. I wrote a book about learning React!